First let me thank you all for giving me this opportunity. I would especially like to thank Shiva Datta Talwar and Chandrakant Kothari for inviting me. I also offer my most respectful pranams to Didiji, Swami Chaitanya Jyoti Parivrajika, and Swami Hari Priya Parivrajika, who have been such kind hosts. I cannot help but be amazed at this situation, as a white man who has been living in Rishikesh, speaking here in Canada on spiritual subjects to Hindus of various backgrounds. And doing so in Hindi, to boot. 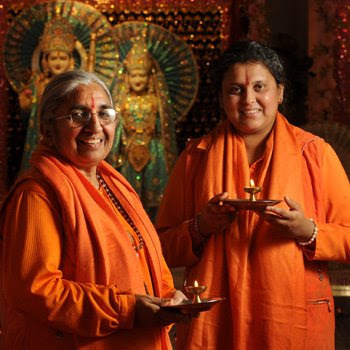 But that is really no more amazing than having two sannyasinis leading a Hindu congregation. Yesterday, Didiji was telling me that she will be conducting a sacred thread ceremony for a young brahmin boy in someone's home. This is such a departure from traditional Indian culture that one has to face the fact of evolution in society, religion and spirituality. For a woman to take sannyas, and for a sannyasi, man or woman, to play this kind of priestly role, is something that even fifty years ago would have been practically unheard of. It is a testament to Brahmarshi Vishvatma Bawraji that he had the foresight and the courage to engage and encourage women to play this kind of priestly role. And the fact that this community is flourishing here in Kitchener is a further testimony to the brilliance of his intuition. A Canadian friend of mine in India, Pierre or Pyari, has learned fluent Hindi. He wanted to marry an Indian girl and went about it the Indian way: He had an arranged marriage. But first he had to go through many rituals, even taking the sacred thread himself in a classical upanayan ceremony. To marry a brahmin girl, he became a brahmin. But what is amazing again is the acceptance of the possibility of such a thing happening. So the idea of caste consciousness is gradually falling away and the Hindu reformers’ interpretation of the Gita verse, chaturvarnyam maya srishtam guna-karma-vibhagashah (“I created the social system of four classes in accordance with their qualities and work”), finally being accepted. Didiji said that this was a necessary step, and that it has not yet gone far enough, either where caste or gender is concerned, and I agree. The universal underpinnings of Hinduism are only realizable when this narrowmindedness drops away. The Gita tells us that the atma is transcendental to the body, and that the learned person (the pandit) sees all, whether a learned brahmin or an outcaste, a dog or a cow, as equal because of the spiritual spark that resides within them. We may discuss forever whether socially the difference is more important than the underlying unity, but if the goal is spiritual knowledge and transcendence, and all the individual qualities that go with them, then that is what we must cultivate and that is what we must teach our children. And we must also teach that whatever one’s beginnings, through the powerful processes of spiritual life, of sadhana, we can all be transformed and become genuine spiritual leaders. Whether one is pure or impure, or in whatever state of life one finds oneself, by remember the lotus-eyed Lord, one is sanctified within and without. When every pore of your body reverberates with Ram’s bija mantra, then you will know, O Bawra, that you have attained love for Ram. 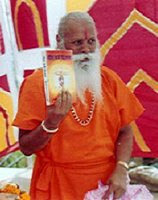 Every Hindu knows that the genius of Hinduism lies in its realization of the one underlying truth, ekam sad vipra bahudha vadanti: “There is one Truth, but the realized souls describe it in many different ways.” And how many versions of this verse can be found throughout the scriptures. There is only one Undivided Consciousness, say the knowers of the ultimate truth, who is named either as Brahman, Paramatman or Bhagavan. God may be all-pervading, in everyone and in everything, but to experience him, we need to find a doorway by which we can enter this world of universal vision. There are many such sadhanas, but all the scriptures tell us that the best way is bhakti. And bhakti is built on nishtha. Bhakti that is spread too thin loses its strength. Hari is to be worshiped always, for he is the supreme overlord of all the gods. But the other gods like Brahma and Rudra should never be insulted or diminished. And this applies of course to believers in other religions and other forms of the divinity. And this is one of the reasons Krishna says in the Gita that one should not disturb the minds of those who worship God for a lesser reason than pure love by telling them to change the external form of their religion. Rather they should be encouraged to continue on their path in the spirit of pure love. So Hinduism is spreading through the world with the Hindu diaspora, and as it does, it is taking so many forms. But the underlying genius of unity in diversity should always be remembered, even as we seek single-minded devotion in the particular path that has been revealed to us by God and guru. And that brings me to one last thing I want to say. In the congregation here today, there are people from many parts of India. Bawraji himself was from Benares and Ayodhya in U.P., but most of the members of this congregation are Gujaratis or Punjabis. And there are many who are from the South and some from Bengal and other parts of India. Globalization has meant that so many people from different parts of India have been thrown all over the world and thrown together to form communities that may resemble very little the ones they grew up in. Indeed, for many Hindu emigrants, the temple is a natural place to find some social life and community. But what is interesting is that this community is not uniquely language or culture based. Naturally, everyone is looking for a community that is familiar—familiar food, familiar deities, familiar stories, etc. But many of the people who gather at a temple like this may not even have had any kind of spiritual impetus in their lives before they realized that they needed this kind of community. But this kind of familiar socializing is hardly the end goal of spiritual life. Actually, every one of us is living out a great drama. A lila, if you will. It is like we are watching the drama of our own lives in a film or reading it in a book. Many people like to turn to the last page of a book to find out how it ends soon after they have started, but usually we can guess very early how a story will end: The hero vanquishes the evil enemies. The lovers are finally united and get married. 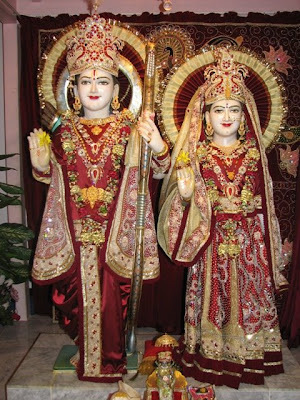 How many times we have heard the Ramayana? We all know what happens, and yet we go on hearing it, again and again. Similarly, I can tell all of you how your story ends. It is like the stories of the Buddha in the Jatakas: He took 500 births in which he performed pious works and austerities until finally he attain Nirvana under the bodhi tree in Bodh Gaya. You are all living so many adventures—many came from Africa after Idi Amin expelled the Indian community. The lives of emigrants are always challenging and heroic in so many ways. But the end of this story, just as it finds you here in this temple listening to Hari katha, is that you all find God. That is the last page of this novel. So, why is there suffering in this world if God is eternal, wise and blissful? And if God is One, and in his oneness is eternal, wise and blissful, then why does he say, "I am one, but I shall become many" (eko’ham, bahu syAm)? Well, the answer is that in fact, all creation comes out of bliss; it remains in existence due to bliss, and it returns to bliss in its conclusion. We may look at the world as suffering, or we may look at it, through a vision of God as its underlying ground of being, as a place of joy. The truth is that since everything is a transformation of the Supreme Bliss, it is joy. The secret is in the story. We are all on the path to God (mama vartmAnuvartante manuSyAH pArtha sarvashaH), and we will all return to God. That is the last page of the book, and every page of life that we go through, every experience, every challenge, every up and every down, is meant to carry us forward to that ultimate conclusion. And, the added secret of this story is, in fact, that is goes on eternally and without any end, for as we experience the love of God and as we learn the art of loving God, the story become everlastingly blissful in ever newer and newer ways. Though many acharyas have said this same thing, Shankaracharya briefly recounts in his commentaries to the Upanishads the story of a prince, who in his childhood was separated from his family and brought up by poor farmers. He grows up and is brought up by them, and neither he nor they know his true identity. Only later, when the king’s ministers recognize him and tell him the truth—even though he first refuses to believe—does he find out who he really is. So, this is our story, too. All of you, all of us, will one day know who we are and will be reunited with our eternal lover, God. But the interesting part is really the story as it unfolds. Like a real novel, turning to the last page does not really add all that much to the fun of reading the book. So, I ask you to think about this: Think about your life as a journey in which you return to your true identity as a servant of God, and enjoy the manifestations of God’s mercy and revelation as they come to you bit by bit. Relish the path and you will understand what is meant by AnandAd imAni bhUtAni jAyante.